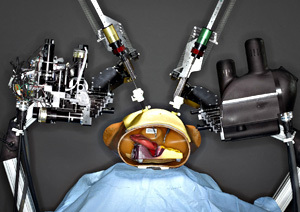 This surgical robot is among the medical robotics research projects led by computer engineer Jacob Rosen. The University of California, Santa Cruz, has launched a new major in robotics engineering, an interdisciplinary field that combines electrical, computer, and mechanical engineering. The new major, leading to a B.S. degree, is the first of its kind in the UC system. "Robots are used in many industry segments today, including automotive, aerospace, electronics and computers, industrial machinery, telecommunications, medicine, agriculture, mining, and textiles. As technology continues to bring cyber and physical worlds together, the demand for robotics engineers will continue to increase, which makes our new major a much needed addition to the curriculum of the Baskin School of Engineering," said J. J. Garcia-Luna-Aceves, Baskin Professor and chair of computer engineering in UCSC's Jack Baskin School of Engineering. The Department of Computer Engineering will administer the new program. Students can start enrolling in the robotics engineering major in fall 2011. The new degree will prepare students for a wide range of careers in areas of industry that include not only robotics, but also biotechnology, computer hardware, and instrumentation. Richard Hughey, a professor of computer engineering who was instrumental in developing the robotics program, said he expects it to attract a lot of students. "The students definitely wanted this degree. It's very well suited for undergraduates who like to design and build things. I'm hopeful that it will attract more engineering students to UCSC, like we saw previously with new degrees in bioengineering and computer game design," Hughey said. The undergraduate degree program complements a graduate minor in robotics and control begun last year by faculty in computer engineering, applied mathematics and statistics, electrical engineering, and technology and information management. The robotics engineering degree will give students a thorough grounding in the theoretical foundations of robotics and control, as well as hands-on experience with robotics platforms and hardware implementation. "Our approach is very multidisciplinary, so students are prepared to deal with both the theoretical and applied concepts, including hardware and software aspects of the field," said Jacob Rosen, associate professor of computer engineering. "The faculty come from very different backgrounds, which reflects the multidisciplinary nature of the field." Rosen's research focuses on medical robotics, including surgical robots and robotic exoskeletons with therapeutic applications. Other faculty involved in the robotics engineering program include Gabriel Elkaim and William Dunbar, both associate professors of computer engineering. Elkaim, whose research focuses on autonomous and embedded systems, teaches the highly popular "Introduction to Mechatronics" course, in which teams of students build fully autonomous robots in just 10 weeks and present them in a public competition at the end of the quarter. "The mechatronics class is a great launching pad for students to prepare them for their capstone design projects," Elkaim said. "We've had an informal robotics and control track, and now that we've formalized it with this new degree, I think it will be a huge draw. It's a very forward-looking degree." Robotics engineering will be an especially intensive and challenging major, but it will give students valuable training, he said. "There's no question we need more people trained in robotics." "The robotics engineering degree will prepare students for building anything that has embedded computer chips and sensors," Hughey added. "Whether or not it's a robot, if a problem involves computers interacting with the real world, robotics engineers will be able to design a solution."